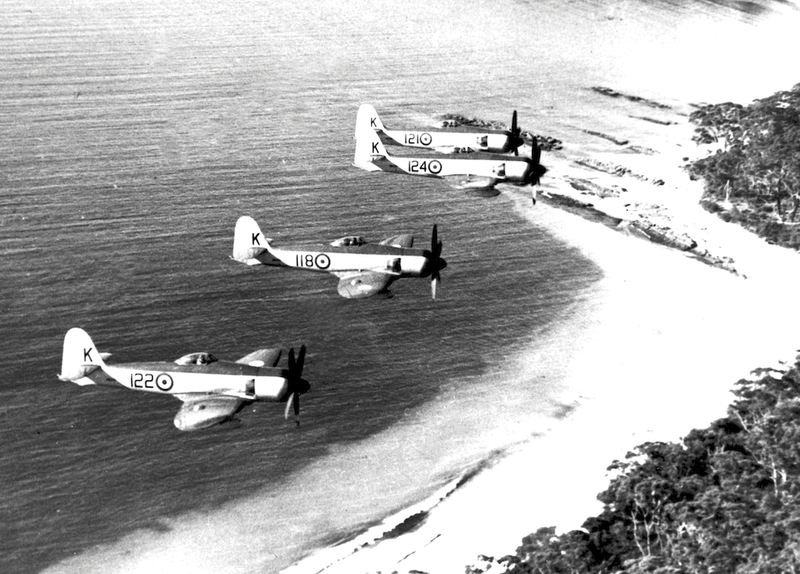 850 Squadron has had the shortest history of all the Royal Australian Navy (RAN) Fleet Air Arm Squadrons. The Squadron originally commissioned in January 1943 as a Royal Navy bomber/torpedo/reconnaissance unit in HMS Empress. The Squadron was later attached to Royal Air Force Coastal Command and added a fighter flight to its number before decommissioning in December 1944. 850 Squadron recommissioned in the RAN at Naval Air Station (NAS) Nowra on 12 January 1953 under the command of Lieutenant Commander Reginald Wild, DFC. Flying Hawker Sea Fury FB IIs, it was not long before the Squadron received word that it would soon be deployed to Korea though not before suffering its first loss. Wild, just five months after assuming command, was killed on 17 May 1953 when his aircraft collided with a Tiger Moth in mid-air over Wagga airfield. The occupants of the Tiger Moth were uninjured. 850 Squadron spent the latter part of September 1953 working up aboard HMAS Sydney (III) alongside 805 and 816 Squadrons for their deployment to Korea. Sydney departed Fremantle on 27 October 1953. Sea Furies in formation from HMAS Sydney. The July 1953 ceasefire meant that Sydney's second tour in Korea should have been a comparatively uneventful affair. However, the deaths of two pilots (one from 850 Squadron, the other from 805 Squadron) and the serious injury of an aircraft handler would mar the deployment. 850 Squadron pilot Sub Lieutenant Michael Beardsall, RN, was killed when his Sea Fury crashed into the sea about 15 kilometres ahead of the ship on 29 December 1953. Beardsall's brother, also a pilot in the RN, had been killed about six months earlier. The Squadron also lost another aircraft on 15 March 1954 when Lieutenant John Brettingham-Moore ditched into the sea, though Brettingham-Moore was uninjured. Sydney departed for Australia on 4 May 1954 and arrived in Fremantle, via Hong Kong and Singapore, on 2 June 1954. After landing her aircraft at NAS Nowra later in the month, Sydney became a general service training ship. 850 Squadron would spend a short time embarked in HMAS Vengeance before decommissioning on 3 August 1954 ending a brief but eventful period of service in the RAN Fleet Air Arm.